At the first of October, just last month, I had the privilege of traveling with other members of our stake and even President and Sister Higbee back to the important sites in early Church history. We visited the birthplace of Joseph in Sharon, Vermont. We visited Harmony, Pennsylvania, where the Prophet Joseph and Emma first lived after they were married. In the home in Harmony most of the Book of Mormon was translated and revelations were received. Just behind that home, not fifty yards, are the banks of the Susquehanna River where John the Baptist laid his hands on Joseph and Oliver’s heads and the authority of the Aaronic Priesthood was bestowed upon them. While Joseph and Emma lived in Harmony, the Apostles Peter, James and John came to the earth and laid their hands on the heads of Joseph and Oliver and bestowed upon them the Melchizedek Priesthood and the holy Apostleship. We visited the Peter Whitmore farm where the Church was organized on April 6, 1830. We walked in the Sacred Grove and experienced the sacred feeling that is there 189 years after the Father and Son appeared to Joseph in that grove. We experienced the place where Joseph was visited by the resurrected being Moroni who told Joseph about the Book of Mormon buried in the hill not far from his home. We climbed that hill, even the Hill Cumorah, where the golden plates lay hidden for fourteen centuries. We walked in the very rooms of the Grandin Print Shop where the Book of Mormon was first printed. The last place we visited was Kirtland, Ohio. I was very impressed with Kirtland as I came to realize all that transpired there. The First Presidency and Quorum of the Twelve were first organized in Kirtland. The School of the Prophets was started there. Great manifestations of God happened there. Sixty-five revelations in the Doctrine and Covenants came to the Prophet while he lived in Kirtland, including the revelation to build the Kirtland Temple. This revelation came before the church was three years old. The Church was new and the Saints were few when the Lord told Joseph to build him a house. It was while I was there in Kirtland that I came to realize that temples, temple worship, and Family History work have been a central reason for the Restoration of the gospel from the very beginning of the Restoration. This might seem obvious to us but it may be so obvious that we don’t think about it. We seem to focus on the concept that the gospel was restored so we can become members of the true Church and be taught the true gospel, and temple work for the living and the dead is just another component of the Restoration. But, it started to become clear to me that this is not the correct way to view temples and family history work. The Prophet Joseph explained to us that the very purpose of the gathering of the Saints and the Restoration of the gospel was the building of temples. What was the object of gathering the Jews, or the people of God in any age of the world?… The main object was to build unto the Lord a house whereby He could reveal unto His people the ordinances of His house and the glories of His kingdom, and teach the people the way of salvation; for there are certain ordinances and principles that, when they are taught and practiced, must be done in a place or house built for that purpose. It was the design of the councils of heaven before the world was, that the principles and laws of the priesthood should be predicated upon the gathering of the people in every age of the world…. So, why the gathering of the Saints? So that there would be enough people with the right skills and enough resources to build a temple. What part did temple building play in the Restoration of the gospel? It has been a central reason from the very beginning. So, the Saints have been gathered, and the gospel restored, so that temples could be built. Why? So that we could receive the ordinances of the Priesthood that have been hid from before the foundation of the world. But not only this. It was so that the “promises made to the fathers” could be fulfilled. God the Father made “promises” to our “fathers” in the flesh, and in fact to everyone in the human family. God the Father’s family, in the pre-mortal life, was promised that even if they lived on the earth when the gospel was not here in its fullness, and therefore priesthood authority would not be here, they would still have the opportunity to hear the gospel. Missionaries would be sent to everyone in the spirit world, and once taught the gospel they would be able to have ordinances performed for them even though they would not have a body. The hosts of heaven shouted for joy at the prospect (Job 38:7). This “promise to the fathers” is apparently one of the major features, facets, concepts and reasons why God the Father wanted to restore the fullness of the gospel and the power of the priesthood. Let’s think about what happened from the beginning of the Restoration. 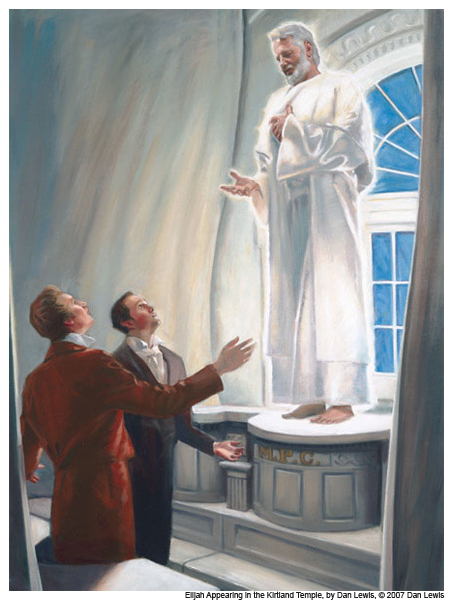 We know that Elijah was commissioned to bring the sealing power back to the earth which he did to the Prophet Joseph in the Kirtland Temple on April 3, 1836 (D&C 110). That sealing power is used in temples to seal families together and in fact all the binding and sealing work in the temple is done because of the authority brought back to the earth by Elijah. Moroni also quoted the next verse in Malachi to Joseph with some modification. This is an obvious reference to temple work and family history work. This statement was made by Moroni in the very first visit to Joseph of a heavenly messenger after the visit of the Father and Son. Temple and Family History work must be very important for Moroni to tell Joseph about the “promises made to the fathers” right then in his first visit. The Lord was anxious to get on with the work of fulfilling “the promises made to the fathers” right from the very beginning of the Restoration. He pressed the early Saints to build temples almost before they had enough people or resources to even build temples. Thus the “gathering” in the early Church from England and other places was commanded so that there would be people enough with skills enough to build temples. Soon after the Saints arrived in Kirtland the Lord told Joseph to build Him a temple. One of the major reasons for the building of the Kirtland temple was so that there would be a special place for Elijah to come back to restore the sealing power of the priesthood. The Prophet Joseph arrived in Nauvoo in 1840. In January 1841 the Lord again told the prophet to build a temple. The doctrine of baptism for the dead was revealed to Joseph in Nauvoo and the Lord explained that a suitable place needed to be built to perform these baptisms. Thus, a baptismal font for baptisms for the dead was built in the Nauvoo temple. I am a product of the gathering for the purpose of building temples. My own Great Great Great Grandfather, William Warner Player, was among them. He and his family joined the Church in England in about 1840. They were the products of the missionary efforts of Brigham Young, Heber C. Kimball and others in England. He was a skilled stone mason. He felt the need to gather with the Saints in America. After arriving in Nauvoo he quickly began working on the temple. His skills were great and he became the chief stone mason on the original Nauvoo Temple. This made him, effectively, the construction manager of the temple. He personally worked on the baptismal font and supervised the construction of the remainder of the temple. Almost the first thing Brigham Young did after the Saints entered the valley was to designate the place for the temple. But this wasn’t enough. The Salt Lake Temple was going to take 40 years to build, which is a long time. The Lord wanted to get on with temple work for the “fathers” so he had the Saints build temples in St George, Manti and Logan, all completed before the Salt Lake Temple. As further evidence of the importance of fulfilling the “promises made to the fathers,” think about the first thing Christ did after his crucifixion. Upon entering the spirit world he organized the missionary force to teach the gospel to those who had never heard it (D&C 138). That missionary force had operated in the spirit world for 1800 years. Everyone who heard and accepted the gospel would need the ordinances of salvation performed for them. By the time the Church was restored in 1830 there must have been a large backlog of people waiting for their temple work to be done. No wonder fulfilling “the promises made to the fathers,” the building of temples, and the performing of temple ordinances has been a central reason for the Restoration of the gospel from the very beginning. Temple work is not an incidental part of the Restoration. It is a critical reason for the Restoration. It continues to be critical to God’s plan to this day. All of the prophets continue to stress the importance of temples and temple work. President Howard W. Hunter was only the President of the Church for a short season. But, during the time he was president he repeatedly stressed the temple. It is the deepest desire of my heart to have every member of the Church worthy to enter the temple. It would please the Lord if every adult member would be worthy of—and carry—a current temple recommend. The things that we must do and not do to be worthy of a temple recommend are the very things that ensure we will be happy as individuals and as families. Temples are being built increasingly faster. The Lord said, “I will hasten my work in its time” (D&C 88:73). We all know that temple building and temple work was central to the work of President Gordon B. Hinckley. When President Hinckley became President of the Church on March 12, 1995 there were about 50 temples operating throughout the world. Today, just fourteen years later, there are 130 operating temples, with many more announced and under construction. Five more temples were announced by President Monson at the last General Conference. The Lord continues fulfilling His promises made to the fathers. It continues to be central to the Father’s plan. In fact it is growing in importance and it is hastening in its speed. We don’t just want salvation, we want exaltation. In order to be like God we must receive the ordinances of exaltation. Those ordinances are received in the temple including the crowning ordinance of the gospel, sealing in the new and everlasting covenant of celestial marriage. In order for God to fulfill his “promises made to the fathers” we must be involved in the work that is obviously so important to Him—temple work. To be involved we must make ourselves worthy to enter the temple, keep ourselves worthy and then return often to do the work for our fathers to whom the promises were made. Surely what Elder Widtsoe said is even more true today than it was when he said it. In addition to receiving the temple ordinances for ourselves, we must search out our ancestors, our “fathers,” and receive the ordinances for them or submit their names to the temple so the work can be done for them. The Lord is increasingly hastening his work of identifying those who have gone before. Family history work is increasing. The spirit of Elijah has already made genealogy research the most popular hobby throughout the land. Even among those who are not members of the Church, or especially among those who are not members of the Church, people are searching out their fathers like never before. Elder Hales then explained the New Family Search program. Those reservations back in the 1970’s are not true today. Many of us have computers and the work of finding our fathers has never been easier. The New Family Search program has just been unveiled here in our own stake [Riverton Utah Stake]. As of the first of November we can now do Family History work right from the comfort of our homes like never before. All of us are now encouraged to go to the new web site new.familysearch.org, register by entering our member ID number and our confirmation date, and then start learning and using this powerful tool for fulfilling the “promises made to the fathers.” If you do not know your member ID number or confirmation date you can obtain them from the ward clerk. There are easy to follow tutorials right on the web site that will teach us what to do and how to do it. We don’t have to be computer experts or genealogy experts. If we need help our Ward Family History consultants will help us. If we don’t have a computer the ward house has a Family History room with people ready to help us. The Church has prepared the new Temple and Family History Course. In clear and easy to follow steps the work is explained. After we do the ordinances in the temple we can go home and check the New Family Search again and by the time we sit down at our computer the temple ordinance information will be updated in the computer. Receive our own temple ordinances and help immediate family members receive them. Hold a current temple recommend and attend the temple regularly. Participate in Family History work. Gather information to identify your ancestors. Record information about your ancestors in the New Family Search to link them into families. Perform temple ordinances for your ancestors who have not yet received them. The Lord does not expect us to submit thousands of names to the temple. Start with the pedigree chart in the Temple and Family History Course materials. Much of the information on the pedigree chart can be filled out right from our own memory or records at home, or the memories of other family members. Fill out the information and submit it in the New Family Search. This will update the information about you and your family. You may find much of this information already there. Just complete it and then go on. If you are the only member of the Church in your family it is important that you start there. If you and your family have been Church members for generations it is important that you start there. Our youth who enjoy so much texting with their cell phones can do indexing work right from their cell phones or computers in their spare time and put their text messaging skills to work. So can the adults. Our lives will be blessed for engaging in this work. President Higbee last week in stake general priesthood meeting, and again while giving instructions to the High Council for preparing this talk, said that worshipping in the temple is the way we will protect ourselves in the difficult days ahead. As the evil night darkens upon this generation, we must come to the temple for light and safety. In our temples we find quiet, sacred havens where the storm cannot penetrate to us… Before the Savior comes the world will darken. There will come a time when even the elect will begin to lose hope if they do not come to the temples. The world will be so filled with evil that the righteous will only feel secure through their faith in Christ and within the temple walls. I believe the Saints will come to the temples not only to do vicarious work but to find a God-given haven of peace. The true and faithful Latter-day Saints will long to bring their children to our temples for safety’s sake… There will be greater hosts of unseen beings in the temple. Joseph told the brethren, “And I beheld that the temple was filled with angels” (History of the Church, vol. 2, page 428). I believe prophets of old as well as those in this dispensation will visit the temples. Those who attend the temples will feel their strength and companionship. We will not be alone in our temples. Everyone is being asked to participate in this great eternity spanning effort. Temples are now more accessible than ever before. Family History, i.e. genealogy work, is now more popular than ever before. Getting the names of our “fathers” in to the temple so their ordinances can be done is now easier than ever before. Excellent talk. Thank you for sharing this! It’s an incredibly important topic that should “occupy our strictest attention” (Joseph Smith). Wow! What an inspiring talk! Please, thank your father for me! It’s good to keep our minds and heart on what matter’s most. I really felt moved after reading this. The temple will stand out more and more as the darkness of the world comes upon us in the future! Excellent talk. I wish I could have been there to hear him deliver it.